NEW DELHI: The collection of Integrated Goods and Services Tax from imports crossed Rs 20,000 crore in July — the first month of the roll out of the new indirect tax regime, pointing towards a major jump in revenues. Total customs revenues in July 2017 stood at Rs 26,500 crore as against Rs 16,625 crore collected in July 2016. Collections have been quite robust,” a government official said. However, the official said IGST collections have also received a boost from the fact that there is a component of state GST as well in the tax. Besides, the government has done away with a number of countervailing duty (CVD) exemptions and not extended them under the GST regime that were available in the previous tax regime, such as that on some electronic products. 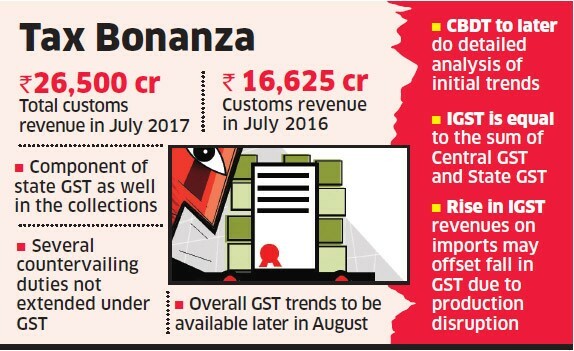 The rise in customs revenues on imports should take care of any decline in GST collections because of any production-related disruption after the rollout of the new regime. Overall GST trends would be available only in August when the final tax collection numbers for July are collated. There is apprehensions that revenues may take a hit because of sluggish sales across the country in the first month of GST. Central Board of Excise and Customs would carry out a detailed analysis of the initial trends when the final numbers become available. India rolled out GST, which replaces 17 central and state taxes such as central excise duty, service tax, value added tax and 23 cesses, from July 1. IGST collections are first revenue trends on the new tax as also indication of the largely smooth rollout. IGST become payable from June 30 midnight on all goods entering the country, barring the exempted ones. IGST on imports replaces countervailing duty and is levied in lieu of state GST and Central GST, but over and above basic customs duty. IGST is equal to the sum of Central GST and State GST levied on any product in the country. GST has subsumed countervailing duty, which was levied in lieu of central excise duty, and special additional duty on imports.